The list on this page is an overview of the various 18th century editions of Quantz’s music that are known to us today. It is largely based on the “Quantz Werkverzeichnis (QV)” of Horst Augsbach. Further information about the printed editions can be found in the QV and in Appendix II “Eighteenth-Century Editions of Quantz’s Music” of the study of Edward R. Reilly “Quantz and his Versuch – Three Studies”. The printed editions of Quantz’s works raise a number of questions relating to the authenticity of certain compositions. In the reference Mary Oleskiewicz pays attention (after Reilly and Auchsbach) to sorting out authentic from misattributed works in the printed editions of Walsh and Witvogel. 1730, 1732 Walsh (and Hare), London Without opus no. 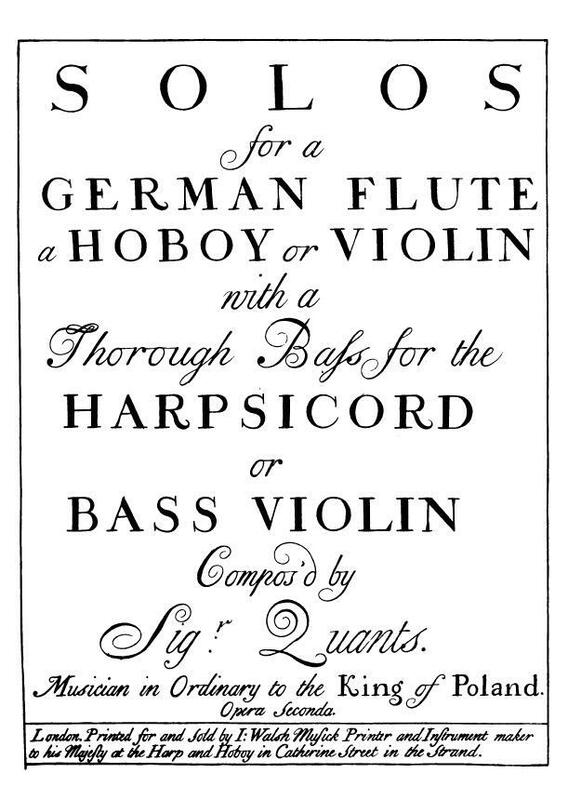 Solos / for a / German flute / a hoboy or violin / with a / Thorough Bass for the / harpsichord / or / bass violin / composed by / Sigr. Quants. / Musician in ordinary to the King of Poland. First three sonatas are authentic. See the reference of Mary Oleskiewicz. 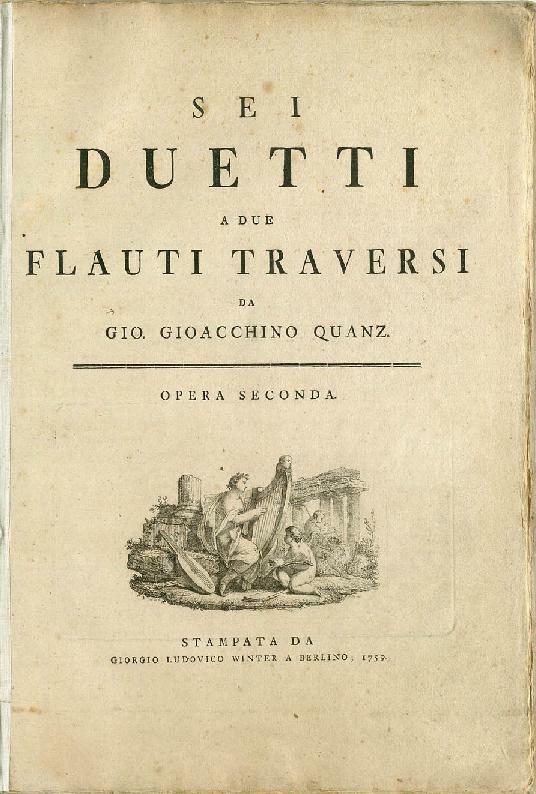 1731 Witvogel, Amsterdam Opera prima VI Sonata / a flauto Traversa solo e Basso Continuo / Del Signor / Quants / Opera Prima / Imprime aux Depens / de Gerhard Fredrik Witvogel. / Chez le quel on Les Trouve / a Amsterdam. 1731 Witvogel, Amsterdam Opera seconda VI Sonate / a Flauto Traversa Solo e Basso Continuo / Del Signor / Quants / Opera Seconda / Imprimé aux depens / de Gerhard Fredrik Witvogel / Chez le quel on Les trouve / a Amsterdam. 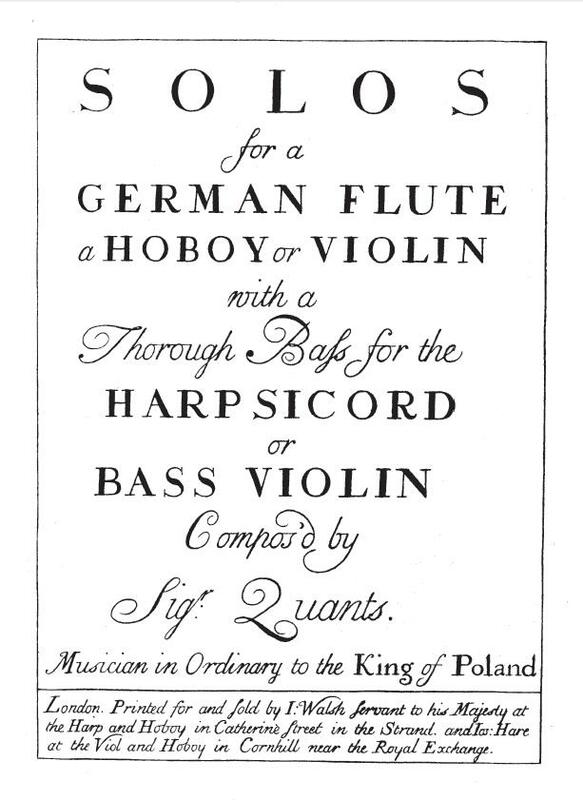 1732, 1739 Walsh, London Opera seconda Solos / for a / German flute / a hoboy or violin / with a / Thorough Bass for the / harpsichord / or / bass violin / compos’d by / Sigr. Quants. / Musician in ordinary to the King of Poland. / Opera Seconda. / London. Printed for and sold by I: Walsh Musick Printer and Instrument maker / to his Majesty at the Harp and Hoboy in Catherine Street in the Strand. 1733 Walsh, London Opera Terza Six / Sonatas / for two / German Flutes / or two / Violins / with a Thorough Bass for the / Harpsichord. / Compos’d by / Signor Quantz. / Opera Terza / …..
1750 Walsh, London Select aires / or / duets / for two/ German Flutes / or two / Violins / By the following Eminent Authors / Handel / Geminiani / St. Martini ? Weideman / Quantz / Pescetti / 2d Book. …. 1761 Birnstiel, Berlin Musikalisches Allerley / von / verschiedenen Tonkünstlern. / 2teSammlung. / Berlin, / bey Friedrich Wilhelm Birnstiel. Königl. Priviligirten Buchdrucker. 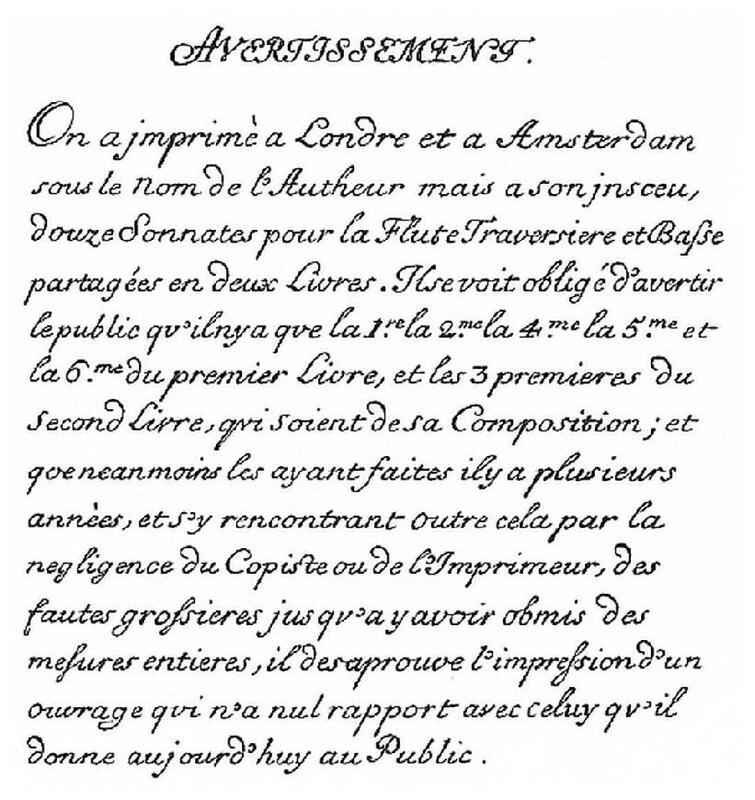 1761.